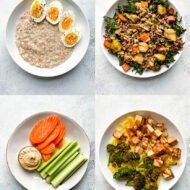 Diets don’t work so let’s talk about what do to instead… here are 14 tips from a health coach for how to lose weight without dieting. 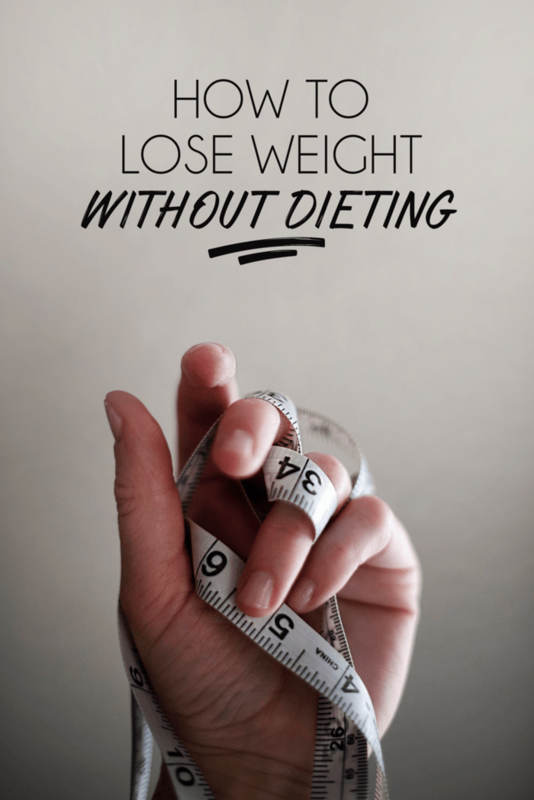 Everyone wants to lose weight without dieting right? It sounds like a dream come true… but in reality it’s probably the best way to lose weight because diets DON’T work. If they did no one would be struggling with their weight and there wouldn’t be loads of new diet books being released year after year. At this point in my wellness journey and my health coaching practice I’ve come to the conclusion that dieting, with strict meal plans and rules about “good foods” and “bad foods”, doesn’t work. It promotes restriction, leads to deprivation and the infamous diet binge cycle. So how do you actually lose weight without dieting? That’s what I’m going to discuss today. Before I get started with the tips I want to clear up one thing. With this article I’m not saying that you can or should lose weight by eating junk food. Fueling your body with nutritious, whole foods is much different than dieting and as you know, I’m all about the healthy foods! The main point I want to get across is that if you’re mindful, there are other ways to lose weight that don’t require following a specific diet, tracking calories and/or macros, counting points or restricting. Okay, now that I have that off my chest, let’s hop right in with my top tips. Take the focus away from food: When you’re on a diet or desperately trying to lose weight, it seems like your world revolves around food and it’s all you think about. What foods you can have, what foods you can’t have, how many calories you’re consuming, what you’ll be able to eat at the restaurant you’re going to and what time your next meal will be, etc? It sort of takes over your life. Let go of this focus and focus on other healthy habits such as getting enough sleep, drinking enough water, taking your daily vitamins, etc. Food is important, but don’t give it more importance than it needs. Once you stop thinking about food all time, you tend to eat less without it being a struggle. Work on other areas of your life: Sit down and list out all the areas of your life — your career, your relationship with your significant other, your relationships with friends and family, your hobbies, etc. Once you have this list, pick a few areas you really want to work on or explore. Pick things that bring you joy and plan to focus on these things daily. 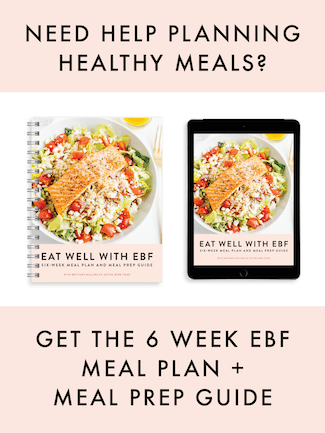 I learned about this side of weight loss during my health coaching training at IIN and was recently reminded of it when chatting with my friend, Abby of Eat Work Play Balanced. It’s amazing how balancing out these other areas of your life brings you peace, helps with stress and balances out your eating. Balanced eating = finding your happy weight. Have more fun: Don’t let food (or alcohol) be the fun in your life. For instance, if the only thing you have to look forward to after work is dinner, change that! There’s so much more to life than food and eating shouldn’t be a hobby. Find something fun that you enjoy and do it often. Food can and should be enjoyable and some meals are super exciting (especially for foodies), but you need other areas of enjoyment in your life as well. Honor your biological hunger: This one comes from Intuitive Eating and it’s one of the best principles to practice when it comes to food. Only eat when you’re actually hungry! When you do this your body will be able to give you fullness signals. If you’re eating when you’re not hungry, those signals will never occur. This one can be tough to figure out because in today’s world many of us don’t actually know what hunger feels like. Take time to tune into your body and start honoring your true hunger. Eat one meal-sized salad a day / eat more vegetables: The water and fiber in veggies fills you up, helps regulate blood sugar and keeps you full much better than processed carbs. One way to get lots of veggies in — eat one big salad a day! Check out my Seven Slimming Salads ebook for lots of healthy meal-sized salads. Other ideas: Add veggies to your eggs (try this frittata or these baked egg cups), use veggies in untraditional ways (like cauliflower pizza crust or these cabbage noodle bowls) and sub spiralized vegetables for pasta (try this spicy shrimp over zucchini noodle pasta or this zucchini noodle pad thai). See my friend Ali’s weight loss journey through spiralizing. It’s so inspiring! Move more: I’m not going to tell you to exercise your way to weight loss because honestly 80% of how your body looks is your diet, 10% genetics and 10% exercise and it’s pretty much impossible (and unhealthy) to out-exercise a poor diet. BUT exercise does help with weight loss and it makes you feel good too! A couple things to consider: Simply getting 10,000 steps a day burns an extra 500 calories a day, which leads up to 3,500 calories a week. If you keep everything in your life the same, but start walking 10,000 steps a day you should lose about 1 pound a week. Build muscle: Did you know that muscle tissue burns more calories than body fat, even when you’re at rest? Research shows that 1 pound of muscle burns around 7-10 calories per day, whereas 1 pound of fat burns around 2-3. Want to build muscle? Add strength training/weight lifting to your weekly workout routine and make sure you’re lifting heavy enough to build muscle. Drink more water: Drinking plenty of water has been proven to help with weight loss, especially if you drink it before meals. Simply replacing water with sugary drinks, like soda and juice, will definitely help you lose weight too! Give yourself a goal (like 64 oz) and try to reach that amount every day. Eat without electronic distractions: Eating while watching tv, on the computer or looking at your phone can cause you to lose track of how much you’ve eaten and overeat. One article suggests that eating while distracted leads to eating about 10% more than you would if you were eating while focused on your food. Turn off those electronic devices and enjoy your food. Swap your plates: Regular sized portions look so tiny on large dinner plates, which may cause you to add more food and ultimately eat more. Using smaller plates can reduce how much you eat by as much as 20%. I like to use our salad plates for regular meals, unless I’m having a big salad as my meal, then I break out the dinner plates! Get plenty of sleep: Inadequate or poor sleep can slow the body’s production of leptin, a hormone that regulates fullness, while amping up the ghrelin, the hunger hormone. To top it off, lack of sleep also increases cortisol (the stress hormone) so your body is more likely to conserve energy and store fat. Not ideal! Keep your hormones balanced by getting those zzzzs. Aim to get at least seven hours every night, but listen to your body because everyone’s sleep needs are different. Read my full post on the health benefits of sleep. Limit snacking: I know that we’ve been taught that the key to boosting your metabolism is eating 5-6 small meals throughout the day, but I personally don’t think this works for everyone. Snacking keeps insulin levels elevated, which makes your body more readily store fat and most adults don’t snack out of hunger. I’ve found that when I snack during the day it’s usually out of boredom, as a way to take a break from work or because it’s “time to eat” rather than because I’m actually feeling hungry. If you’re eating well-balanced, substantial meals they should keep you full for at least 3-4 hours and you shouldn’t be hungry all the time. All this said, snacking is totally fine in some cases (i.e. when you’re actually hungry or need something to hold you over between lunch and dinner, before a tough workout, etc.). If you’re a big snacker, be mindful of your habits over a few days and see if you’re actually snacking out of hunger or for other reasons. Give up alcohol: Alcohol has a ton of empty calories, it stimulates appetite and lowers inhibitions so you’re more likely to indulge in unhealthy foods. If you’re serious about weight loss, cutting back on alcohol will really help, especially if you’re a regular drinker. As you’ll see most of these tips are simple healthy habits that when combined create a HUGE impact. And don’t worry, you don’t have to do them all at once! Start small by choosing a few that resonate with you and start incorporating them into your daily life until they become a habit. Need support with this process? I’m hosting a Healthy Habit Challenge focused on 10 healthy habits (many of which are on this list). The challenge starts Monday, January 9th and it’s only $20 to sign up. Get all the details and register here. Sources: Small Plates to Lose Weight (cornell.edu), Distracted Eating May Lead to Weight Gain (harvard.edu), Drinking Water Helps with Weight Loss (authoritynutrition.com), Sleep Can Help You Lose Weight (womenshealthmag.com), Snacking Can Stall Fat Loss and Fast Metabolism (huffingtonpost.com). Great tips! Thanks for sharing. So many good ideas that people don’t often thing of when it comes to dieting or eating healthy. It’s amazing how even just drinking more water can change everything! Such great tips! I think the less I think about my weight, the happier (and thinner) I am! Great post! And I especially like your point that eating 5-6 meals a day doesn’t necessarily work for everyone. I’ve seen people eating for the sake of eating just to meet this recommendation, even if they are not hungry. This makes people overly conscious about the act of eating not their biological feeling of hunger vs satisfaction/full. Yes, I’ve seen this same thing! Eating just for the sake of eating takes us further away from listening to our bodies and knowing what it feels like to be hungry. I’m all about honor our biological hunger! I love “take the focus away from food.” Such a simple concept and the opposite of what so many magazines etc. recommend, but so true for intuitive eating! wonderful post and very informative anyone would be benefited, the strategy you explain is very easy and simple to follow. Thank you for carefully explain to us how we could help ourselves lose weight with just diet all alone. This is very helpful to people who have no time to go to gym to balance the diet for their body. Thanks for the very useful advice for me. This article provides great tips and diet plans. Thanks for sharing.